In March of 2015 when Miami Township in Montgomery County, Ohio hired a consulting firm to assess its public works department, the focus was initially on financials. How could the department balance its budget and better utilize its resources in the wake of recession-induced staffing and funding cuts? During the assessment, it became clear that the department could be organized better, from logging staff time on projects to centralizing records. This would maximize efficiencies and ultimately save the department — and taxpayers — money. 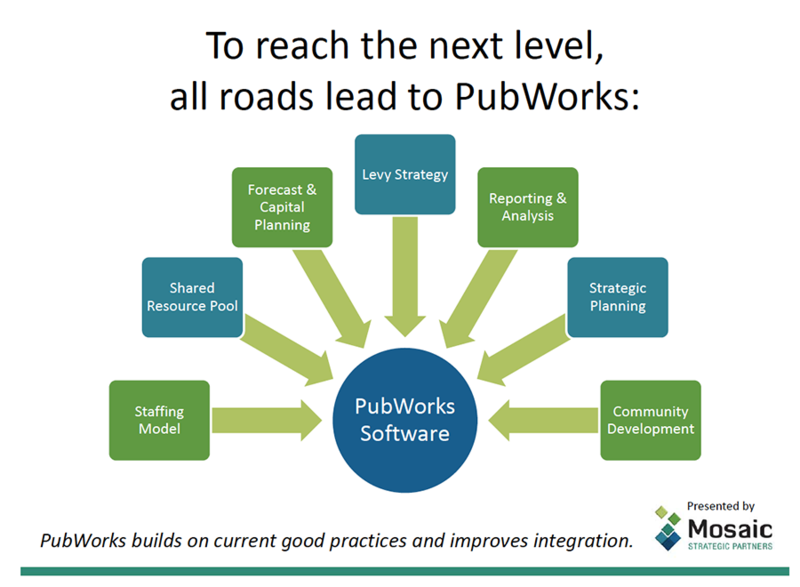 As it turns out, PubWorks was key to realizing those efficiencies. Miami Township’s public works department had been using PubWorks since 2006, but its four sub-departments also used a mix of spreadsheets, manual log books, and software programs to keep track of various parts of its operations. It was a piecemeal system that didn’t allow managers to see the whole picture without putting a lot of time and effort into pulling together various pieces of information. But the whole picture is exactly what Edward Livesay of Mosaic Strategic Partners wanted to see during the firm’s organizational assessment. In the end, one of Livesay’s main recommendations was to centralize virtually all of the department’s information in PubWorks. That includes anything and everything to do with the department’s 18 staffers: what crews they’re on, time per project, and basically tracking every hour of every full-time, part-time, and seasonal employee. When vehicles and other equipment are input, the department can analyze their productivity over time. PubWorks keeps track of every project on every street in the township, including when it was last resurfaced and what type of material was used, providing a complete road history that’s useful for planning and budgeting. Parks maintenance, stormwater systems, bike paths, and leaf collection projects are maintained with a similar level of detail. Having that wealth of information is not only valuable internally, Livesay explains. “This information impacts your levy and communication strategy,” he said, explaining that PubWorks’ capabilities offer a level of transparency the department didn’t previously have. By being able to pull out exactly what it would cost to increase parks department staff or repair streets that have been neglected due to funding cuts, department officials can now show township trustees and citizens that they’ve done their homework and are not simply looking for a handout. PubWorks also allows the public works department to be a more influential player in growth decisions as economic development ramps up in Miami Township. Livesay likens the economic development team to a sales force of a company, while the public works department is comparable to the service department. Often, he notes, sales doesn’t think about what services are needed to maintain a product. But PubWorks permits department officials to be able to explain exactly what it takes to maintain an acre of park land or a mile of bike path, and communicate what equipment and staffing would be needed. That is the true total cost of ownership and must be part of any development conversation. The bottom line, concluded Livesay, was that PubWorks represented a paradigm shift within the Public Works department that enabled department officials to run their business better and make it more efficient, for years to come. Now we’re doing whole systems in PubWorks — it’s kind of everything we do. It’ll be used as kind of a check-up to make sure we’re as efficient as we can be and spending taxpayer dollars wisely by maximizing our efficiencies. The bottom line, was that PubWorks represented a paradigm shift within the Public Works department that enabled department officials to run their business better and make it more efficient, for years to come. If you’re interested in getting PubWorks up and running quickly in your organization, join us for a FREE Demo.